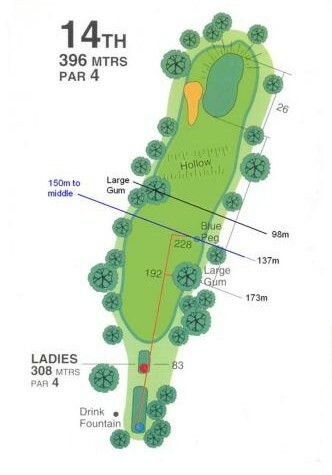 A very strong Par 4 of 396m, a straight tee shot is required aimed at the centre of the fairway. The fairway does open a little near landing area around 150m from the green. The green slopes from back to front and putting from above the hole can be very quick, so aim to be below the hole. However this is made difficult because of the undulating fairway and large dip before the green. Don’t miss this green long.